Registration will only be complete if all forms above are completed and the registration fee is paid. 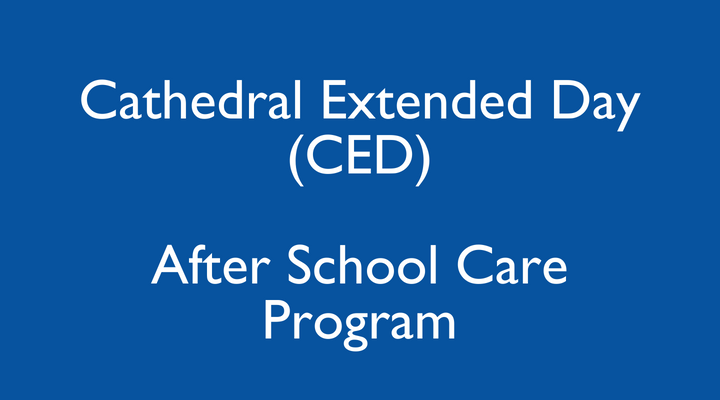 After-school care is offered to Cathedral students, which includes various enrichment and academic activities, led by experienced faculty and skilled care providers. All students (including drop-ins and emergency drop-ins) must be pre-registered in order to attend. This is required by the State of Maryland, which regulates and licenses our program. Please remember that CED closes promptly at 6pm. After 6pm, late fees will be applied. Our State certification states that our operating hours are until 6 pm. If you are late twice, you will be asked to leave CED. If school closes early due to inclement weather, CED will be closed. This service is available only to those who are registered, have paid the registration fee, and give 24-hour notice in advance. Children who attend CED two or more days per week MUST choose a monthly plan; this is not a drop-in option. This is available to those who are registered with CED. Space may be limited, please give 24-hour notice. Contact Ms. Bergin at mbergin@cmoq.org.